All one needs to make a well-shaken starter is a sanitizable vessel that is at least four times the volume of the starter being prepared, a sanitizable screw-on cap for the vessel, and a funnel. I do not know if anything comparable is available in the UK; however, one U.S.-gallon glass jugs (demijohns in UK speak) are plentiful in the United States. Home brew supply stores sell plastic replacement caps for these jugs that can be sanitized (38mm polyseal screw top caps). If one has money to burn, a 5L borosilicate glass media bottle like I currently use is a very nice toy. However, 5L media bottles can cost prohibitive when purchased new. I acquired my current 5L media bottle as unused laboratory surplus, and it was not cheap. 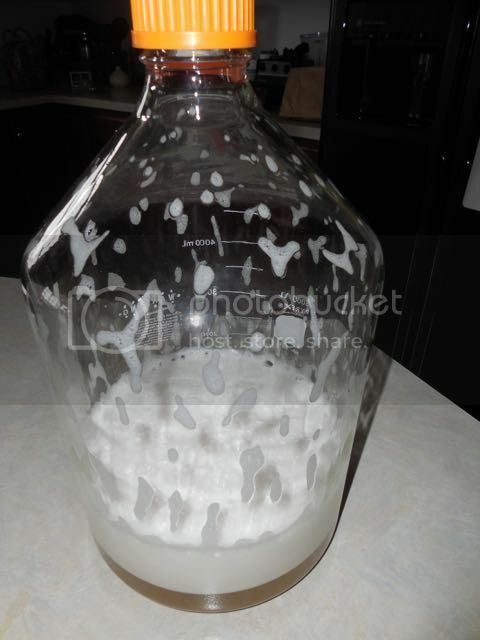 I used a 1-gallon glass jug for a very long time before switching over to using a 5L media bottle. The starter medium is prepared like one would prepare a starter any other way. A 10% weight/volume solution is made by mixing 100 grams of pale DME into a little more than 1L of water. The goal here is to end up with 1L of media after the solution has been boiled and cooled to room temperature. I boil the solution for 15 minutes in a 3-quart stainless steel sauce pan (A U.S. quart is slightly smaller than a liter). The media is chilled in the sauce pan with the cover affixed using an ice water bath in my kitchen sink. The starter vessel, screw-on cap, and funnel should be sanitized while the medium is boiling and chilling. While I use bleach and StarSan, feel free to use your preferred sanitizer. It is critical that the funnel is sanitized as well, and that one does not touch the inside surface of the funnel after it has been sanitized. Note: One thing that I like to teach home brewers is to get into the habit of wiping the lip over which yeast or nutrient will be poured with an alcohol saturated cotton ball before decanting yeast, medium, or supernatant (supernatant is the clear liquid that lies above the solids in a starter, yeast crop, or a batch of beer). Wild microflora (yeast, mold, and bacteria) rides through the air on house dust. What we want to do is ensure that we do not drag any dust that may have come to rest on the pouring lip of the container that we are decanting into a vessel in which we intend to grow a culture or ferment a batch of beer. This precaution makes sense If one thinks about what a nurse or doctor does before giving one an injection. The reason why a doctor or a nurse cleans an injection site with an alcohol wipe before giving one an injection is to prevent the needle from dragging microflora that is on one’s skin into the injection site. After placing the funnel in the starter vessel, one should wipe the pouring lip of the sauce pan in with an alcohol saturated cotton ball before pouring the starter medium into the starter vessel. I use 70% or 90% isopropyl alcohol. I used to use 95% ethanol (a.k.a. grain alcohol). However, my state outlawed its sale due to teenagers and young adults abusing it. Any 140 proof or better clear spirit will work. Please do not use methylated spirits. If using a White Labs vial, wipe the pouring lip of the vial with an alcohol saturated cotton ball before pouring the yeast culture into the starter vessel. If using a Wyeast smack pack, wipe the outside of the smack and the blades of the pair of scissors that one is using to cut a corner off of the smack pack with an alcohol saturated cotton ball before making the cut, and wipe the cut edge of the smack pack with an alcohol saturated cotton ball before pouring the contents of the smack pack into the starter vessel. Here’s where my method differs from the way the average home brewer makes a starter. The reason why a vessel with a screw-on cap is necessary with this method is because one is going to shake the culture very vigorously for about a minute. I usually tell brewers to shake the starter vessel like it owes you money (think mafia enforcer). The goal here is to attempt to turn the media into foam. That's why the vessel has to be at least four times the volume of the starter. One should then allow the starter to sit for around thirty minutes before loosening the cap to allow the foam to drop. Pitching is one area where most home brewers get it completely wrong. A starter is not a small batch of beer. It is a yeast biomass growth medium. The goal here is to grow the culture to maximum cell density and then pitch it. Maximum cell density occurs at high krausen. Beyond that point, all cell reproduction is for replacement only. Yeast taken at high krausen is much healthier than yeast that is taken from a sedimented starter or batch of beer. That’s why traditional breweries crop yeast at high krausen. Allowing a starter to ferment out and settle places the cells in the yeast equivalent of hibernation where they will have to undo survival-related morphological changes that occurred at the end of fermentation as well as completely replenish their ergosterol and unsaturated fatty acid reserves after being pitched. High krausen should occur within 12 to 18 hours after pitching the starter. The yeast biomass grows exponentially, not linearly. The yeast cell count grows at a rate of 2^n, where the symbol “^” means raised to the power of, and n equals the number of minutes that have elapsed since the end of the lag phase divided by 90; hence, the difference in propagation time between 200B cells and 400B cells can be as little as 90 minutes. If one believes the yeast calculators found on American sites, one will end up growing 2 to 3 liter starters for 23L batches. Frankly, the guys who wrote this code know more about coding than they do about yeast. No two yeast cultures behave the same when pitched, and no two yeast cultures require the same pitching rate. The only thing that will teach one the proper pitch rate for any given strain is experience with the strain in one’s brew house. Additionally, it is often desirable to underpitch in order to achieve a desired flavor profile. British styles benefit from underpitching. I often pitch as little as 60B cells into 19L of wort when fermenting normal gravity beer (i.e., < 1.065). Wyeast 1768, which is allegedly Young’s stain, performs much better when pitched at a rate of 3B cells per liter than at a rate of 10B cells per liter when fermenting normal gravity ale. It produces what I like to refer to as the British lollipop ester when the beer is young. This strain produces a delightfully fruity and malty pint when used with a grist that is composed mostly of British pale malt. Sure. My son is game! I'll edit my blog entry to reflect that, Mark. But in neither this start or any of my others do I ever really see foam, unless I shake them after fermentation has begun. Then it dissipates quickly. Are you referring to foam produced during shaking or foam produced during incubation? Foam only when shaking, not during the "regular" fermentation, which I assume is what you mean by "incubation". And it's not nearly as much foam as what I see in your picture. Turning the medium into mostly foam is the key to this method. If you are not producing at least as much foam as can be seen in the photo above, then you are not shaking vigorously and/or long enough. I literally screw the cap down tight, and shake the vessel vertically as vigorously as I can for one minute. A lot of people attempt the method with a solid rubber stopper, but a screw on cap is really not an option with the method. One literally has to shake the starter like one is attempting to collect money from it for the mafia. One of the British brewers that I know from another forum wins the prize for shaking. He managed to turn media almost completely into foam. That feat requires a massive amount of shaking. With the above said, I shared this method with the community because I felt that there was a need for a low-cost, low-tech, shear stress-free method for producing a healthy starter. I hope that people do not attempt to generalize the method in the way that many specific methods have been generalized by the community. It usually works without fail if all of the conditions are met. It is counter-intuitive to me that shaking the heck out of a starter is "shear stress-free." What am I missing? The shaking is done prior to the pitching of the yeast vial or smack pack to the starter. That makes sense but the instructions appear to say that the starter is inoculated first and then shaken. The technique is not completely shear stress free if the starter medium is inoculated before shaking. The initial mother cells will experience shear stress. However, their daughters will not. One can inoculate the medium after shaking if complete elimination of shear stress is desired. In my case, the daughter cells that are produced during incubation greatly outnumber the initial mother cells because I pitch cells that were grown in 40ml of 5% w/v wort into 600ml or 1L of 10% w/v wort (I propagate from slant). With a White Labs vial or Wyeast smack pack, it may pay dividends to inoculate after shaking, as the ratio of initial cells to daughter cells will be closer to 50:50. The technique is not completely shear stress free if the culture is pitched before shaking. The initial mother cells will experience shear stress. However, their daughters will not. One can inoculate the medium after shaking if complete elimination of shear stress is desired. In my case, the daughter cells that are produced during incubation greatly outnumber the initial mother cells because I pitch cells that were grown in 40ml of 5% w/v wort into 600ml or 1L of 10% w/v wort (I propagate from slant). With a White Labs vial or Wyeast smack pack, it may pay dividends to inoculate after shaking, as the ratio of initial cells to daughter cells will be closer to 50:50. MArk, are you saying that an initial shaking is all that's required? Do you shale during incubation? The only culture that I have had to shake more than once is NCYC 1333, but NCYC 1333 is a class O3/O41 Yorkshire-square culture, meaning that its O2 demands can barely be met by wort that is saturated with pure O2. I suspect that most of the brewing strains that we use are either class O1 or class O2 (the O2 demands for class O1 strains can be met with wort that contains 4ppm dissolved O2 whereas class O2 strains require 8ppm). I know for certain that Whitbread "B" (Wyeast 1098, White Labs WLP007, and Fermentis S-04) is a class O2 strain because it is the same culture as NCYC 1026, and NCYC 1026 is a class O2 culture. O2, DMS 33 µg/l, low acetic, high lactic, diacetyl 0.42ppm only, used commercially in Tower Fermenters (continuous process), non head-forming, no estery flavour. Contains 2µ plasmid. Note: If anyone has ever wondered why Wyeast 1098 and WLP007 produce a slightly tart beer, it is due to the strain's propensity to produce higher than normal levels of lactic acid. OK, so you shake the hell out of it at the beginning. Your "instructions" post was unclear about when you pitch the yeast...before or after shaking? The steps in the process outlined above are sequential. Many people have pitched Wyeast and White Labs cultures before shaking without serious negative effects; therefore, the I am assuming that one minute of vigorous shaking is not enough to stress the living daylights out of the initial mother cells. Those who want to avoid any possibility of encountering shear stress should wait until after shaking to inoculate the stater (i.e., pitch the Wyeast or White Labs culture). However, I will be curious to see if there are any major differences in performance. I believe that there is room for improvement with any process. However, we do rapidly reach a point of diminishing returns. To be completely honest, I was amazed at how well the technique was received within the British home brewing community. For as stodgy as Americans believe that British people can be, the U.K. home brewing community appears to be far less dogmatic than the U.S. home brewing community. They have provided a lot of useful feedback. The technique has been a much harder sell within the American home brewing community because we have the propensity to make simple things difficult and oversimplify difficult things. Amen, brother! Thanks for the info. Now that I know I didn't make mine per your instructions, I'll be curious to see how it performs. Maybe we'll discover yet another way to do it. Just a guess here, if you inoculate post shake, might you miss out on some of the surface area contact that is supposed to be one of the benefits? I'm guessing that pre-shake inoculation means there are yeast cells happily replicating in the foam.